We are Vermont! is a calendar created to benefit 350Vermont. Our goal is to share the creativity, passion, diversity, and progressive activism of Vermonters through beautiful color images donated by talented photographers. We will feature images of organic farms, farmers’ gardens, protests for climate and migrant justice, renewable energy, our outspoken and brave progressive elected officials, the women’s march, and more. Nothing like this exists in Vermont, as all the currently available calendars are comprised of images of scenery, either in photographs or in artwork. We plan to offer this calendar for sale through book stores, gift stores, through 350Vermont, and at events this fall. This will be an exciting and well received project. 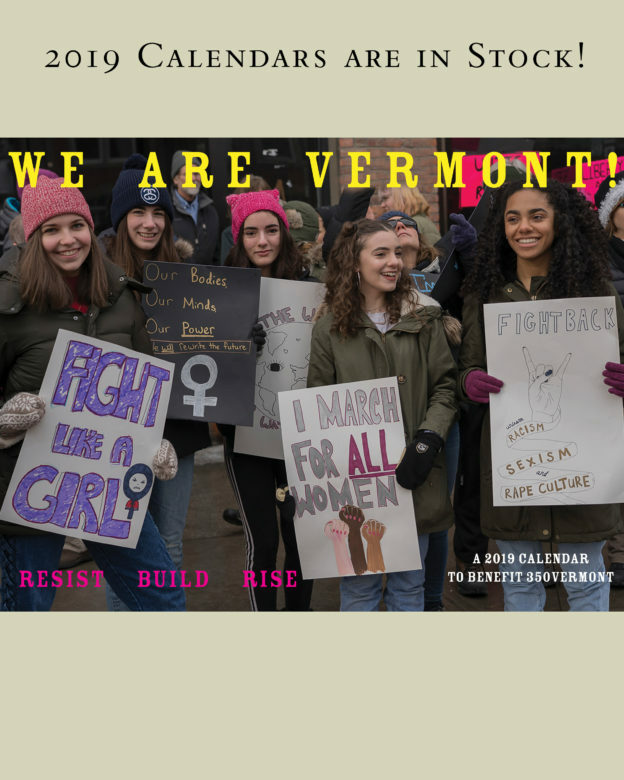 We will be beginning to collect images for the 2020 ‘We are Vermont’ Calendar in January 2019. We know Vermonters will be busy growing food, enjoying the nature of our beautiful state, working to make our communities more welcoming and livable, finding innovative ways to lead in the fight for climate justice, and creatively resisting the conservative minority who are trying to reshape our country. We hope to hear from some of the many talented photographers documenting our lives and work. If you wish your images to be a part of this exciting fund raiser for 350 Vermont, contact us at wearevermont@gmail.com. We also would love your input. How can this calendar be more beautiful and more useful as a tool to help us work together to create a healthier, more sustainable, and more joyful state and world. Visit 350vermont.org to learn more about the many ways that you can get involved. From there you can join in the fight for climate justice and sign up as a volunteer to help in our mission to end the carbon crisis. In addition, there are numerous other environmental and agricultural organizations throughout the state that are working just as hard to find bold solutions for climate change and the many other pressing issues that we face today. To get involved locally, let your voice be heard. Find out if your Vermont town has an energy committee where you can let town officials know of the necessity of transitioning to a renewable economy. Finally, you can write letters to your local media and call your representatives; you can also help by gleaning after the harvest to give food to the local food shelf. 350-VERMONT MISSION: 350VT organizes, educates, and supports people in Vermont to work for climate justice —resisting fossil fuels, building alternatives, and transforming our communities for greater justice and resilience. AVAILABLE FOR PURCHASE NOW & YEARLY! Front cover photo by Terry Allen.